Toll Of War: Broken Hearts, Marriages For Marines Marines fighting the Taliban in Afghanistan's Helmand province face another foe, too: the strain of separation from loved ones that sometimes leads to heartbreak and divorce. Phone calls home are rare, and letters can sometimes take weeks. Officers and chaplains seek to counsel and comfort the Marines. The Marines of the 2nd Battalion, 8th Regiment, operated mainly in Helmand province. Marine Lt. Samuel Oliver, a platoon leader, sorts through paperwork on his rack at Camp Leatherneck in Afghanistan's Helmand province. Since his unit deployed deeper into Taliban territory, Oliver has had to counsel young Marines in combat who are feeling the strain of separation from home. He's also had to manage his own long-distance relationship with his fiancee, Hannah. The Marines fighting in Afghanistan's southern Helmand province are facing a tough Taliban insurgency. They're also facing the strain of separation from fiancees, wives and kids. The deployment is starting to take its toll as the 2nd Battalion of the 8th Marine Regiment out of Camp Lejeune, N.C., known as "America's Battalion," nears the halfway point of its seven-month mission in Afghanistan. One Marine, after arguing with his wife on the phone, threw his wedding ring out into a wheat field. Another Marine's wife told him she wanted a divorce, and he was eager to forget about his home life by going on endless patrols. "I made him stop and take a couple of patrols off," says 2nd Lt. Sam Oliver, a platoon leader with the 2/8 Marines. "But it's his way of dealing with it. If keeping busy is keeping him sane, I'm all about it." The battalion's more than 800 Marines are part of the thousands of additional troops the Obama administration sent to Afghanistan this summer to counter the Taliban insurgency and help the country prepare for national elections on Thursday. Oliver and other officers have been busy focusing on their mission: to clear the area of Taliban forces. They are working out of small firebases in villages along the Helmand River valley. But the crumbling personal lives of some of their men require their attention, too. "The biggest thing is there's not a whole lot you can do for them," says Oliver, adding that the lack of communication with family members can sometimes magnify problems. 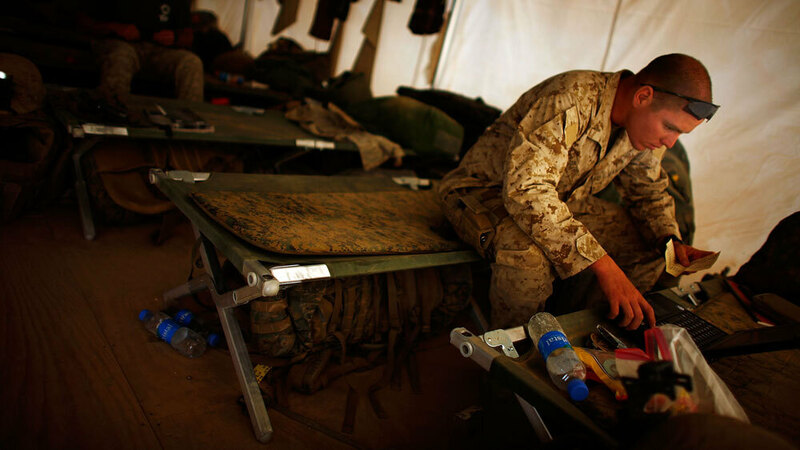 The Marine battalion's chaplain, Navy Lt. Terry Roberts, sits in a supply tent at Camp Leatherneck. He tries to comfort Marines in the field whose relationships sometimes suffer under the stress of distance and war. Phone calls home are rare, and letters can sometimes take weeks. "It's not like they can go home and take care of his problems. It's something that's going to have to wait four months before he can take care of it," Oliver says. 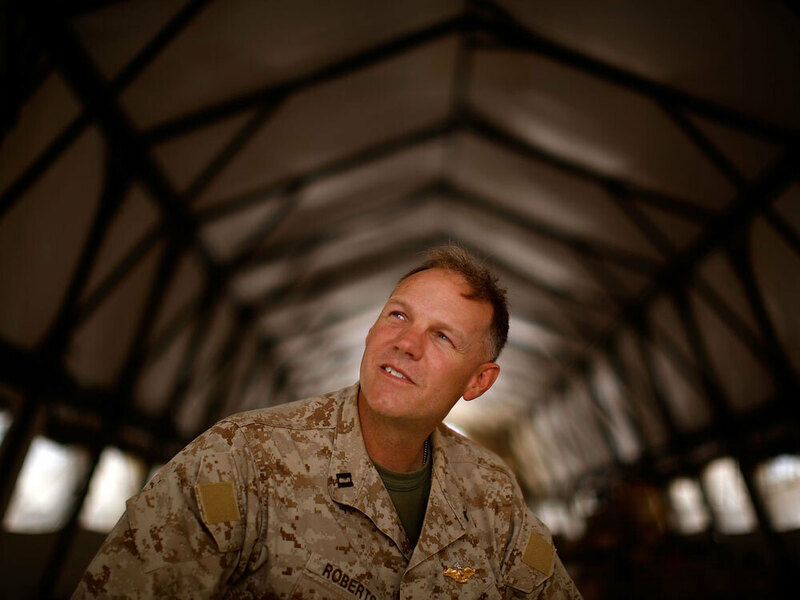 Navy Lt. Terry Roberts, the battalion chaplain, is poised to try to handle such problems. A burly man with thinning sandy hair, Roberts has been on three deployments. He works from a large tent at Camp Leatherneck, the Marines' desert base. A crude wooden sign announces the time for prayer service. "A lot of things I deal with are relationship-related. In fact, most things I deal with are domestic issues," Roberts says. "You just got to sit down. I say, 'I'm 43 years old, and I've got a little bit of life experience with relationships and things.' So we sit down with the young man, and we talk through it. And [I] tell them, 'This is not the end of the world. Good things happen, bad things happen, and we press on,' " he says. Young marriages are especially vulnerable. One Marine lawyer says that every now and then a wife back home will empty a joint bank account. A common cause for broken relationships is Marines who end up dating for a short time, then marrying just before a deployment. Roberts says some of the younger Marines find love at some of the more seedy bars outside their base at Camp Lejeune, hooking up with women who already have children. "I generally discourage anybody from getting married just before a deployment, even if they've been in a dating relationship for a while," Roberts says. "They all listen. Whether they follow my instructions is another thing," he says with a chuckle. Some veteran Marines, like 1st Sgt. Derrick Mays, have found a way to make it all work. He has been in the Marine Corps for 18 years, with many deployments away from his wife, Marcia. They have three children. The oldest is 17, the youngest is 3. First Sgt. 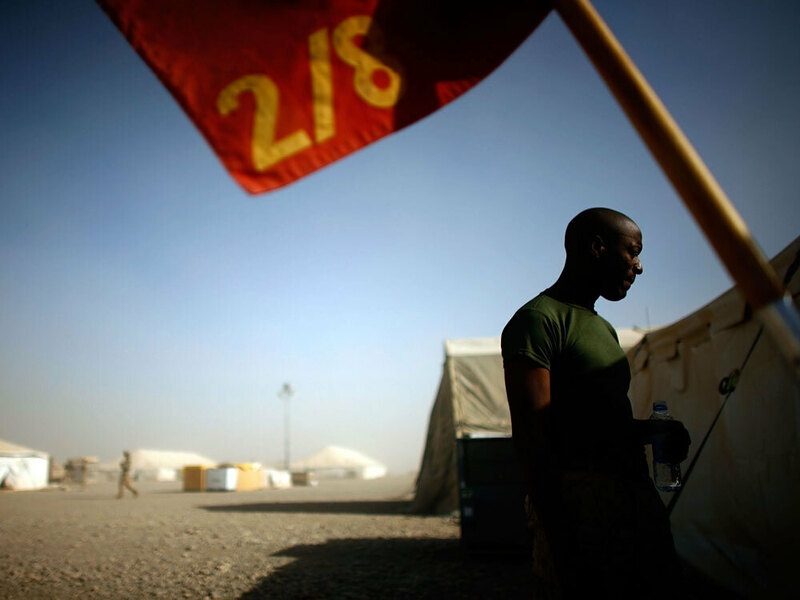 Derrick Mays stands beneath the company colors outside of a tent at Camp Leatherneck in June. An 18-year Marine Corps veteran, Mays says his wife, Marcia, has a way of tolerating the long deployments. "It doesn't get any easier, but she tolerates it," Mays says. "She'll always tell you that it don't get any easier. She has a way of tolerating it and moving on." Mays calls his wife occasionally, but finds hearing her voice can make the separation all the more painful. He also likes to record himself reading children's books. He sends the tapes to his daughter Kennedy, 7. The family has created its own traditions, Mays says. "We kind of celebrate all of the holidays that we missed once the deployment is over with," he says. "So I was lucky enough to be there for my 7-year-old's birthday. I didn't make it for my 3-year-old's birthday, but those are things we catch up on once I get back." Oliver, the platoon leader, is looking after his men — and his own relationship back home. He plans to get married shortly after he returns to the United States. The Marines expect to arrive back at Camp Lejeune around Christmas. Meanwhile, he struggles with how to tell his fiancee, Hannah, when she should expect to hear from him. "You don't, like, want to say, like, 'Hey I'll call you on this day,' because you don't know if you'll be able to. So you'll say, 'I don't know when I'm going to call you again, probably sometime within the next month, maybe two months tops,' " Oliver reasons. "So if you do, then it's a surprise. I mean, if not, then nobody's freaking out that you're not calling." Then again, he's uncertain if this strategy makes sense. "I might get home and find out that was a really bad idea," Oliver says. "So we'll see."